You’ve heard all the advice: Drink eight glasses of water a day. 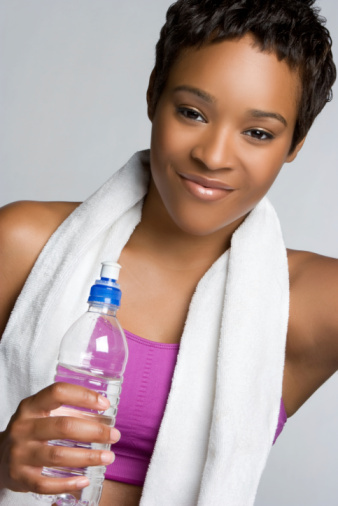 Stay properly hydrated while exercising. Sports drinks aren’t just for professional athletes. Yet you’re still unsure whether you’re drinking the right amount for good health. How much fluid should you really be taking in daily? Do you need to add extra when you’re physically active? And is too much water dangerous? Everyone’s body needs water. We lose it by sweating, excretion, or simply not taking in enough through foods—like fruits and vegetables—and drinks. Mild dehydration (losing less than two percent of your body weight due to inadequate fluids) can cause health problems, including dizziness and headache. Get the basics. Most women need eight to nine cups of total fluids a day, including all beverages and the water in foods. Increase according to the weather. High temperatures or humidity outside, heated indoor air and high altitudes all cause you to need more fluids. Add when exercising. Drink one cup of fluids every 15 minutes during physical activity, advises Werner W.K. Hoeger, Ed.D., FACSM, professor of kinesiology and director of the Human Performance Laboratory at Boise State University. He recommends sports drinks over water when exercising because they contain electrolytes—important to provide the minerals necessary for proper cellular metabolism—which is disrupted during physical exertion. Electrolyte replacement also helps maintain proper muscle contraction and cardiac function. Add more for big events. If you’re going to be in a race or charity walk, make sure you drink enough to be well-hydrated the day before, Hoeger adds. Also, drink a glass of fluids an hour before the event. Drinking for two? Pregnant and nursing women need additional fluids. Talk with your health care professional about what’s best for you.